Scrum masters are servant leaders and coaches for Agile teams. They help the team in educating and ensuring whether Agile processes are being followed. Scrum Master helps in structuring a high-performing team dynamics, continuous flow, and relentless improvement. 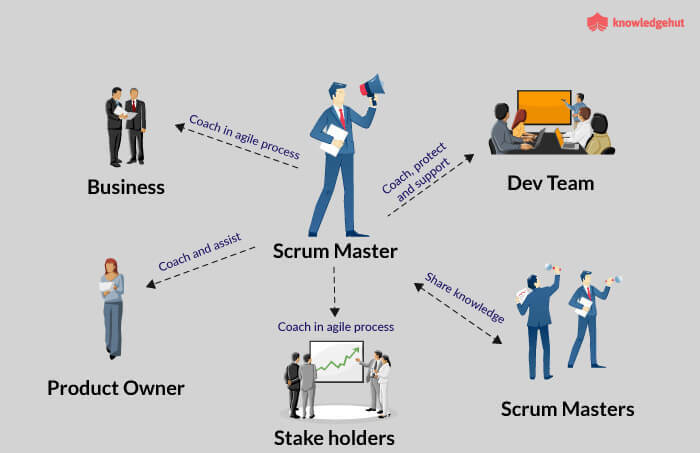 Scrum Master role is mainly one of a unique, Agile team member who spends much of his time helping other team members communicate, coordinate, and cooperate, generally he assists the team in meeting their delivery goals. When we talk about Scrum Masters, the basic roles and responsibilities include – being a Scrum Guide and a facilitator. And most importantly, being someone who removes impediments and shields the team from external interferences. Basically, a go-to person if any problem arises during Scrum implementations. Why do we put a Scrum Master in our teams? Scrum Master is a mentor or a coach who makes sure that all the values, principles and procedures are followed properly. They take care of the team and help in removing impediments. A Scrum Master’s work follows basically the principle of self-organization and he/she also plays a mediator role which results in a balance in the work. The mediator role of a Scrum Master benefits in two ways. On the one hand, they are able to protect the team from an aggressive product owner who might have unrealistic demands. As a result, the team doesn’t fully commit to the work. On the other hand, the Scrum Master protects the team from complacency. This means that he or she is constantly encouraging them to learn better and also produce better results. 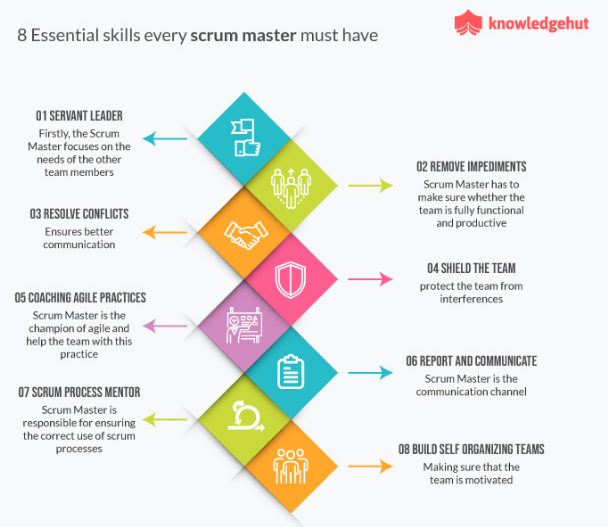 What’s the added value of a Scrum Master? Scrum Master adds value to the Scrum team in several ways. Beyond the coaching and leadership roles, the Scrum Master plays a significant role in handling the administrative role as well, to check through whether the team has the proper equipment and environment to perform their tasks. The Scrum Master also checks if all the requirements are up to the mark for meetings, where the open questions are asked, and deadlines are discussed. A Scrum Master ensures an effective communication among the different members of the project. And the team members share the information and knowledge with the client and make sure to follow a healthy environment and a better workflow. However, what makes you a highly successful Scrum Master? Just performing these basic roles and responsibilities? Or If you are an HR hiring a Scrum Master, what would you look for in a highly successful Scrum Master? Scrum Masters are the ones who are most knowledgeable when it comes to the understanding of implementing Scrum Framework. It is very important that this Scrum knowledge flows through all levels within the organization. For the team to implement Scrum successfully., Scrum Masters must have strong coaching skills. They should be able to coach team members and explain the “what” to do, “how” to do, “why” to do within the process implementation. They should always work on the team’s motivation and growth. Servant leadership means putting other people before yourself. As the name implies- “Servant Leader”, is about the one who would like to serve. It’s not just about being a positional leader (a leader who leads because of a higher position). Rather, it’s about being a servant for the team, helping them grow and assisting them in meeting their goals. You can learn more about “Servant Leadership – How To Put Your People Before Yourself” in one of the articles by Forbes. A large part of a Scrum Master’s job involves facilitating events and meetings. In order to do that, it’s very important that a Scrum Master is a great communicator as well as a collaborator. Must be able to handle communication as well as collaboration in many different aspects of the project. We know that our Scrum teams comprise of different people. It is a cross-functional and self-organizing team. When people from different cultures, ideas, and working styles start collaborating and start working together, it’s very common to have conflicts. That is when a Scrum Master needs to jump in and resolve the conflicts as early as possible to keep the project going and the team working towards a common goal. The basic responsibility of Scrum Master is to remove impediments. However, if the Scrum Masters themselves are problem solvers, this saves a lot of time. Instead of escalating the problem, they are able to solve it themselves. This is one of the most essential quality, a Scrum Master must have. Daily scrum, sprint planning, sprint demo are the responsibilities of a scrum master. Scrum master should be friendly and communicative because when the team is moving fast in the process, communication is the effective force which holds the team together. A scrum master needs to forecast the numbers of deliverables can be done in an iteration. Help individual or team to clarify goals and actions in order to achieve them. Ability to ensure the correct use of the scrum process. See where you land yourself with these qualities! Over the years, Scrum has found wide applications in cross-sectoral domains. Scrum masters are in high demand, as companies are increasingly looking for ways to get their projects completed and their products launched in a bid to capture a outsize market. According to LinkedIn’s “Most promising jobs of 2017,” job openings (by year over year growth) for Scrum masters is up 104%, and the career advancement score is 8 out of 10. To conclude, a Scrum Master is expected to perform many roles at one time. They should always balance their leadership, management, and technical skills to achieve their goals. Great insight of a scrum master ?